If you read the tech press, you’ll hear that artificial intelligence (AI) is all the rage these days. And whether or not they are doing it well, everyone is saying that they’re engaging in AI. One thing is certain: organizations across industries are running fast to be a part of the AI revolution. In this two-part series, I’ll examine what’s driving this rapid pace of adoption, and why some companies are seeing far more success than others. In part one, I’ll discuss some of the needs inherent in creating an AI solution. It certainly feels like AI use cases are everywhere! There are the obvious examples: AI to improve online advertising placement, enhance fraud detection, and power digital assistant apps. But there are also a lot of edge cases popping up: I know of one company using AI to reduce the number of plastic milk crates that go missing each year, for example. Another is using AI to decrease the number of returns in the online running shoe market. Still another is making soundtracks for video games. No matter which use case an organization is pursuing, AI helps to find patterns, enhance efficiencies, reduce risks and deliver new user experiences that offer competitive advantages. It’s no wonder that companies of all variety are racing to create new AI experiences. However, implementing these AI solutions is a lot like climbing a ladder–I’ll call it the AI Ladder. As you climb up the ladder, the scarier it gets, the slower you climb, and the more risk you take on. But what happens when someone you trust puts their foot down on the first rung, holds the sides, and stabilizes the ladder? You climb faster, higher, and with confidence. And in the case of AI, a well-designed, AI-ready infrastructure is that trustworthy friend helping you to climb the AI Ladder. Infrastructure plays a critical role in positioning organizations to climb the AI Ladder faster, higher, and with more confidence. It can help them to deploy more quickly, alleviate time-consuming training tasks, and reduce the risk of failure due to lack of data science resources. 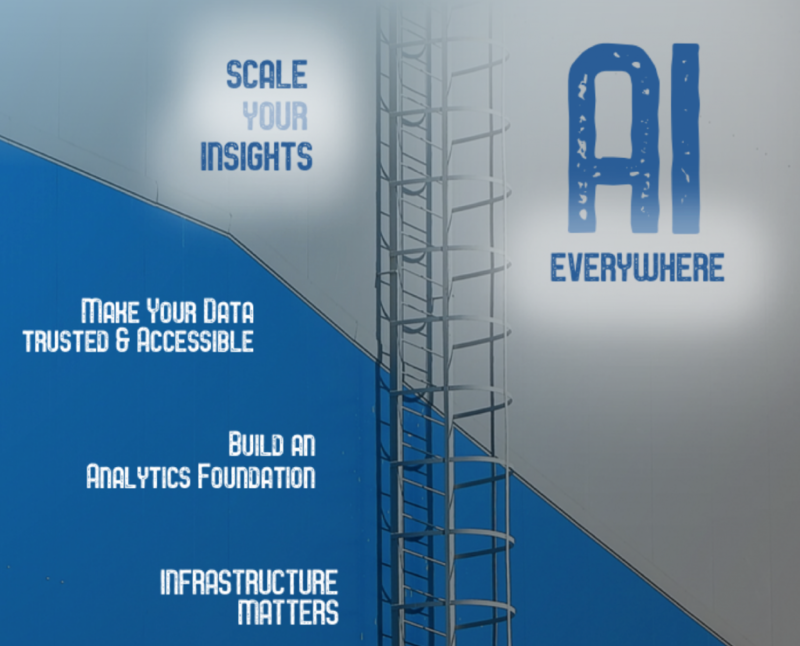 For example, infrastructure can help you get more of your organization involved in running AI so that your data scientists can stay focused on the analysis tasks that require their unique skills. Today, it seems that much of a data scientist’s time isn’t spent on data science at all; rather it appears to be spent preparing and wrangling their data, getting (and keeping) their frameworks up and running. Tasks that prevent them from getting to that higher rung of the ladder and seeing the actual benefits of an AI solution. A well-designed infrastructure can also help improve the accuracy of AI models by letting organizations iterate faster and fine-tune their models more easily. Think about how high-end automobiles can automatically adjust the way their engines work to maximize fuel economy in response to a driver’s behavior; a good AI infrastructure should similarly be smart enough to help an organization optimize effortlessly. In part two of this series, I’ll discuss what I view as a critical piece of infrastructure to help organizations achieve AI success. In the meantime, if you’re struggling with how to climb the AI Ladder, feel free to reach out — I’d love to discuss with you how to move past those first few rungs and reach new heights with your AI solutions. You can simply comment on this blog post, or find me on Twitter. Learn more about PowerAI Enterprise. The post Accelerate AI projects with the right infrastructure (Part one) appeared first on IBM IT Infrastructure Blog.